It was still dark when I woke up and I tip-toed about the house so as not to wake up the rest of my family. After a hurried breakfast of oats and some bananas, I went through my trek checklist and gathered up my equipment and left a note saying where I was going and what time I would be back in case I was out of phone coverage for the rest of the day. It was still misty as I drove out of the gate and my GPS showed that I was an hour from my destination. The faint glow of dawn could be seen as I reached the turn off to the Nalaknad Palace road. Driving past the palace I made a mental note to stop on my way back for some photography, though I had been to the palace before, I didn’t have any good images of it. Eventually after some four wheel driving, I reached the end of the motorable road and parked the car in a clearing by a tribal hut. Making sure I had enough water for the trek, I shouldered my backpack and headed up the trail to Tadiyandamol. 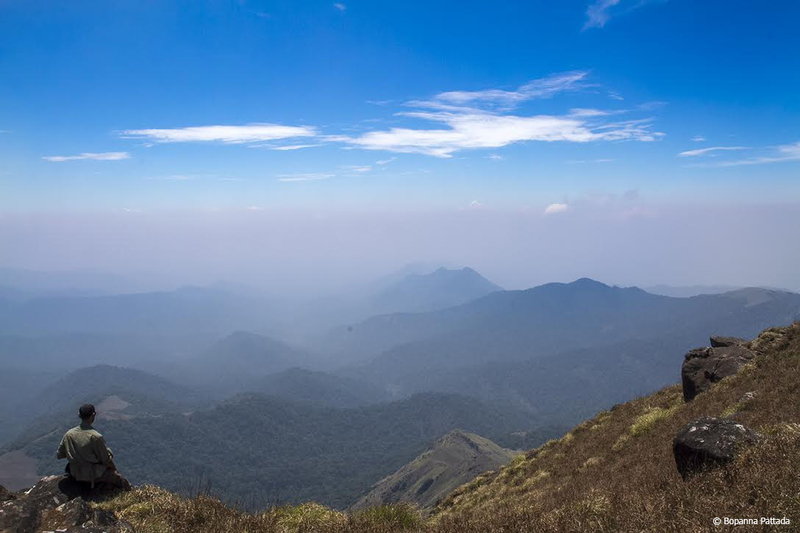 Tadiyandamol or Tadiandamol is the tallest peak in Coorg district, at a height of 1,750 meters (5,682 feet) above sea level. 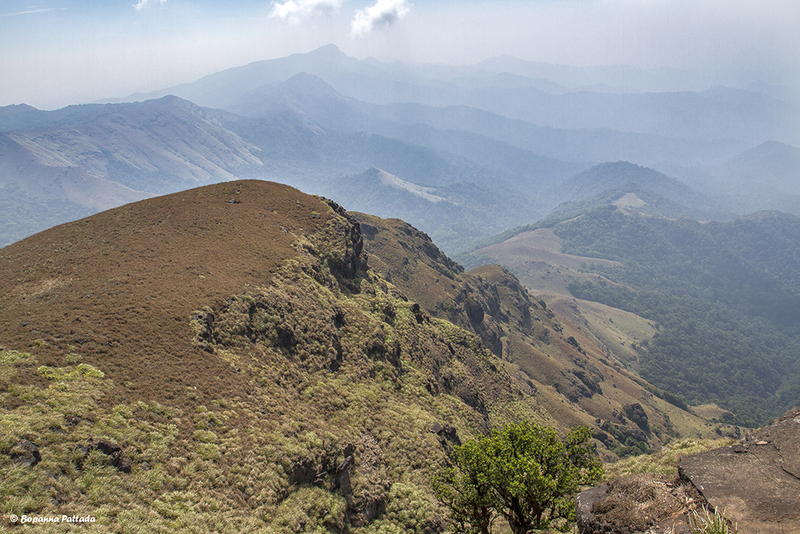 The name Tadiandamol means “broadest and tallest mountain” in Kodava Thakk (language). The trek for the most part is not very strenuous, however the gradient is very steep as one gets closer to the peak. I took my time, stopping to take a few images of the breaking dawn. The sky had a lilac hue to it and the hill tops below were shrouded in mist giving the scene an ethereal feel. 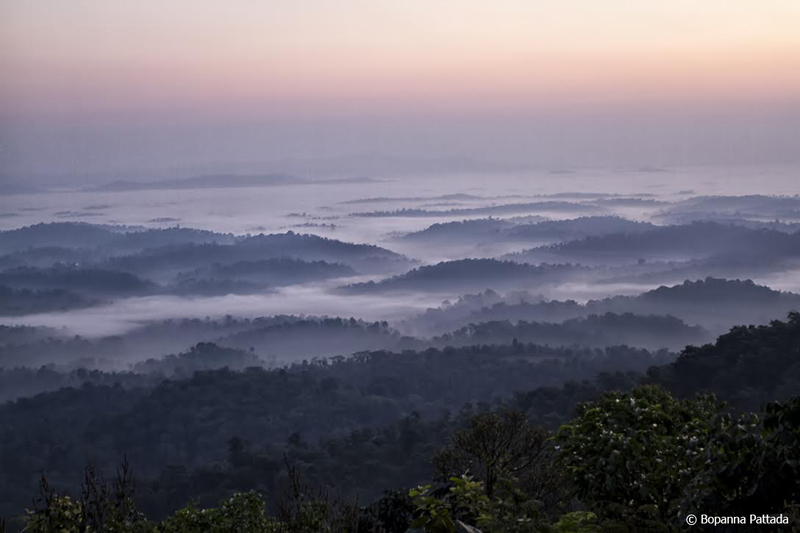 This is probably one of the most fantastic views to be had anywhere in Coorg. The tripod really helped in the low light and held the camera steady enough to make this image. Most of the vegetation along the path consisted of short trees interspersed with grassland in between and the view to the right of the path is of a valley which appears largely forested with a few human dwellings scattered here and there. People were beginning to wake up in the houses below and I could see plumes of smoke trickling out of the chimneys as they prepared hot coffee! I could have done with a steaming hot cup of coffee on that cold morning too but that would have to wait as the peak beckoned. A stream cut across the trail at one point and the vegetation here was thicker and more lush, and the trees were taller too. There was enough light now to be able to see the birds going about their business. 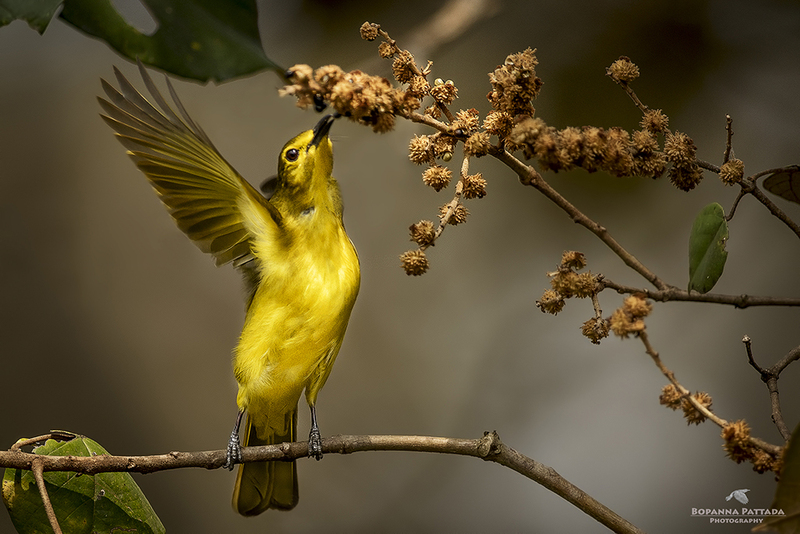 A yellow-browed bulbul fluttered as it tried to reach out to a tasty morsel. Flocks of Mountain Imperial Pigeon flew overhead as they made their way to the fruiting ficus trees in the valley below.The trail turned narrower as I reached the base of Tadiandamol from where the trek turned from a walk to a climb. The montane sholas stood out marking the valleys in between the grasslands. Most of these sholas had a stream running through them with crystal clear spring water. 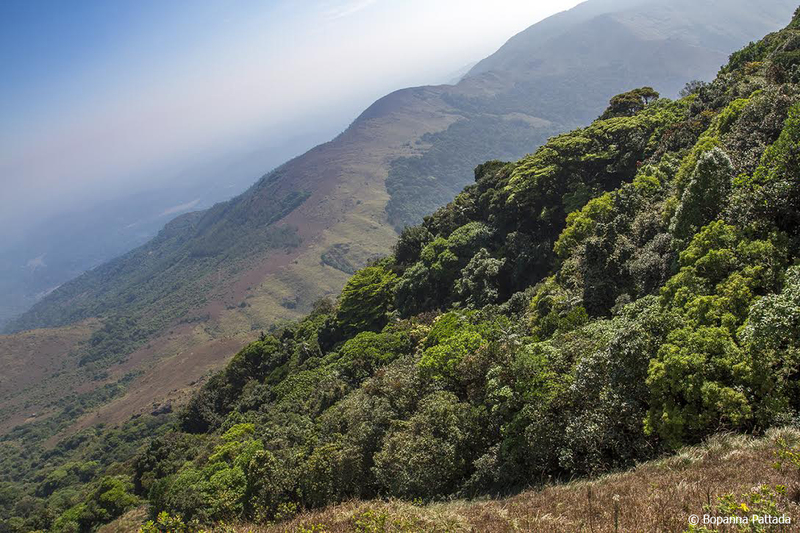 Shola forests are montane evergreen forests found in the highest reaches of the Western Ghats and harbour more endemic taxa across birds, plants, fishes and invertebrates from what little we know at present. This habitat is known for its water retention ability and most south Indian rivers originate in this habitat, supporting millions of people and their farmlands downstream. The dominant trees in this type of forest are Michelia niligarica, Bischofia javanica (bishop wood), Calophyllum tomentosa, Cedrela toona (Indian mahogany), Eugenia (myrtle) spp., Ficus glomerata (atti or cluster fig tree or gular fig tree) and Mallotus spp. 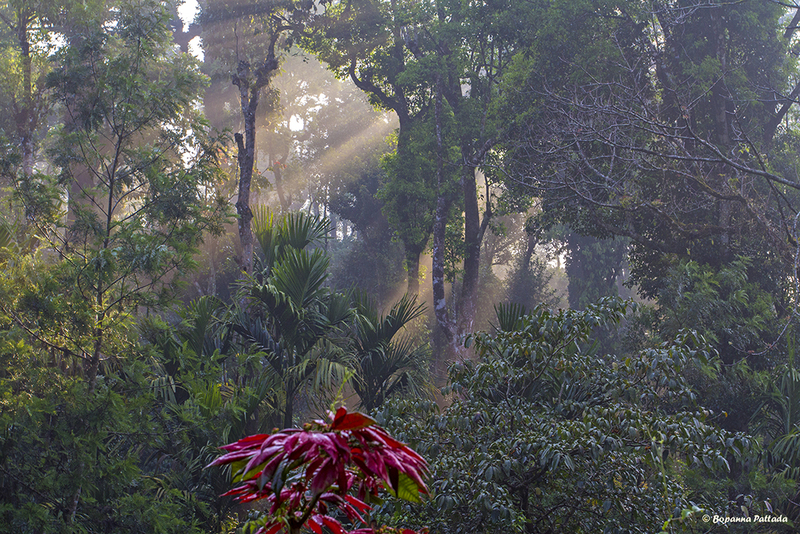 Shola forests have an upper storey of small trees, generally Pygeum gardneri,Schefflera racemosa, Linociera ramiflora, Syzygium spp., Rhododendron nilgiricum, Mahonianepalensis, Elaeocarpus recurvatus, Ilex denticulata, Michelia nilagirica, Actinodaphne bourdellonii, andLitsea wightiana. Below the upper story is a low understory and a dense shrub layer. There is a thick concentration of mosses growing on the under-story and many ferns in the sunlit narrow transition to grassland. Shola forests are interspersed with montane grasslands, characterized by frost- and fire-resistant grass species like Chrysopogon zeylanicus, Cymbopogon flexuosus, Arundinella ciliata, Arundinella mesophylla, Arundinella tuberculata, Themeda tremula, and Sehima nervosum. 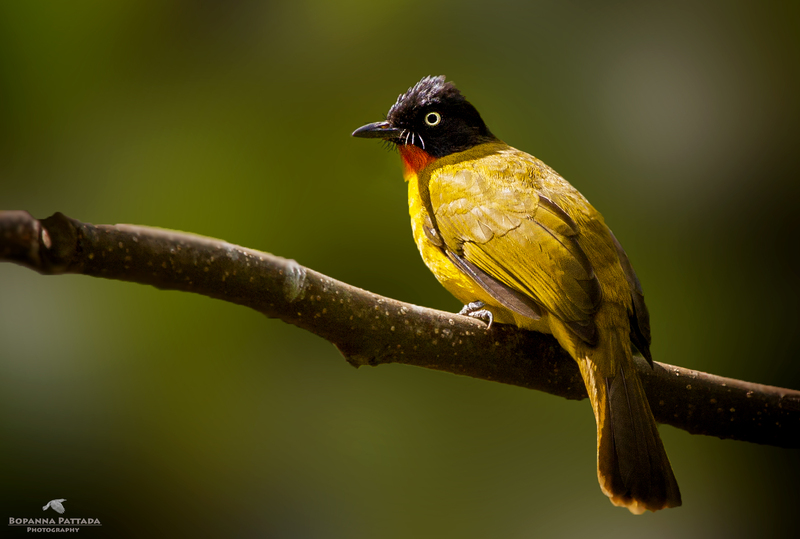 The sharp calls of the Flame-throated bulbuls gave away their location on a tree above. 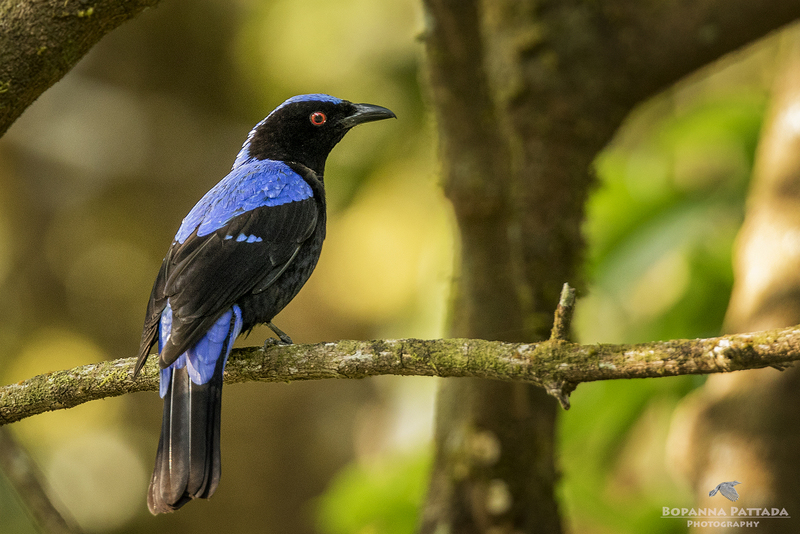 These gorgeous birds are endemic to the Western Ghats of India. The heavy backpack was starting to weigh me down, in addition to my telephoto camera setup I was also carrying a wide angle camera setup for landscape images. The few stops I made to watch the birds were a welcome break from the climb. The peak was not far away and already the views were staggering. The other side of the mountain towards Kerala is a very steep drop off compared to the trail I had taken. A rocky ledge just below the peak made for an inviting seat and I set up the camera on the tripod for a timer shot of me taking in the view from the ledge. Looking out, straight ahead were the Kabbe hills and Choma Kund beyond. The views were simply spectacular. To my right was the Kerala border and in the distance I could see the ocean off the Malabar coast. All around me were lines of mountain ridges in the distance. A pair of Painted Bush Quails were calling from somewhere on the hillside below me and I was able to find and watch them using my binoculars. It was still a little early for raptors like the Black eagle and the Rufous-bellied eagles so I sat and enjoyed the great views for a while longer. I scanned the ridges with binoculars to try and see if I could locate some large mammals like Gaur and Elephant but to no avail. They had probably made off into the sholas shortly after day break. The trek to the peak was about three and a half kilometres from where I had parked. I would have liked to spend more time on the peak but I reminded myself that I needed to visit the Nalaknad palace on my way back. Shouldering my backpack, I made my way back down the mountain. Somewhere along the way a shrill call from the valley below told me that a Black eagle was not far away. I made myself comfortable on a rock along the trail and waited. Sure enough a black eagle flew above the treetops just below me. 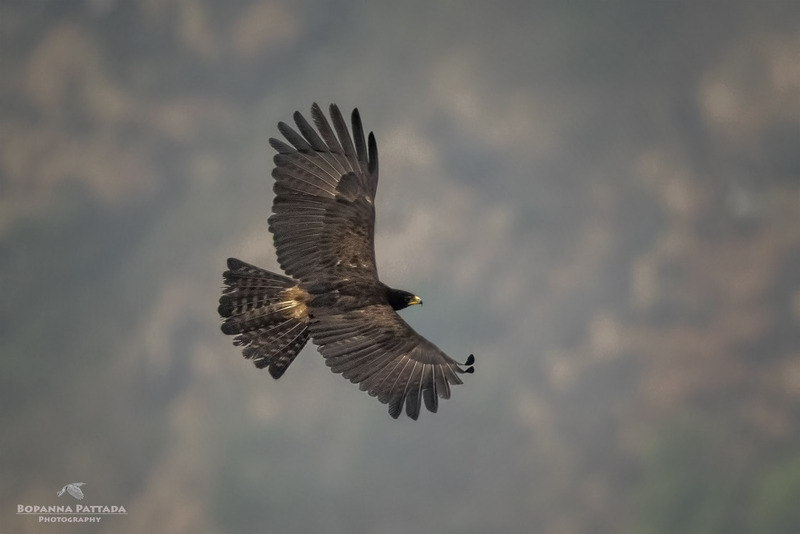 The black eagle (Ictinaetus malaiensis) is a bird of prey. They soar over forests in the hilly regions of tropical Asia and hunt mammals and birds, particularly at their nests. They are easily identified by their widely splayed and long primary “fingers”, the characteristic silhouette, slow flight and yellow ceres and legs that contrast with their dark feathers. I watched the bird for a while as it soared over the ridges before getting back on the trail. I needed to re-fill my water bottle and could hear a stream further along the path. As I made my way towards the stream I was startled by a barking deer or Muntjac which bolted across the path and ran down the hill side. In my mind I thought about an old Kodava folk song which features the barking deer and I hummed the tune as I walked along. An Asian fairy bluebird was busy feeding in a tree ahead of me. When it saw me, it hopped onto a branch and gave me an opportunity for a lovely photograph. The water was cool and refreshing and I snacked on an energy bar and looked around at the multitude of butterflies around the stream. One in particular was extremely pretty, the Malabar banded peacock kept flying around but it would occasionally come back to a sandy patch along the stream. 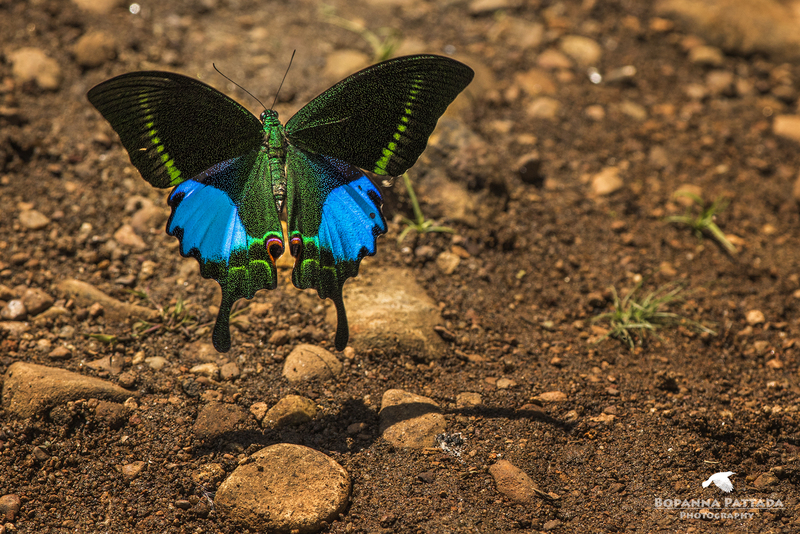 By staying still near this patch I was able to photograph the butterfly in flight with its gorgeous wings spread open. Sadly I noticed that some trekkers had discarded trash along the trail and I gathered up the plastic wrappers and put them in my backpack to discard at the next town garbage dump. The rest of the trek was un-eventful and I reached the car where I met some other trekkers from Bangalore who were getting ready to climb Tadiandamol. After a brief chat I drove towards the Nalaknad palace which was not far away. Nalaknad Palace or Nalakunadu aramane, called Naalnaad Aramane in the local Kodava language is a palace located near a village named Yavakapadi and was built between the years 1792 and 1794 AD. 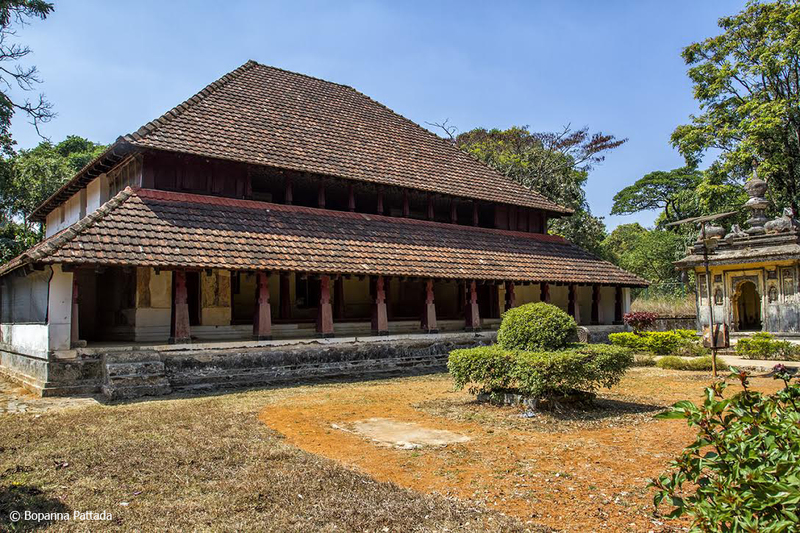 This palace was the last refuge of the last of the Haleri kings of Kodagu, Chikka Veerarajendra before he was deposed by the British. The palace is a protected monument under the aegis of the Directorate of Archaeology and Museums. Happy with my image of the palace I made my way to the closest town, Cheyendane where I stopped for a hot cup of tea and some food before returning home. A nice ending to a fantastic day out in the mountains. 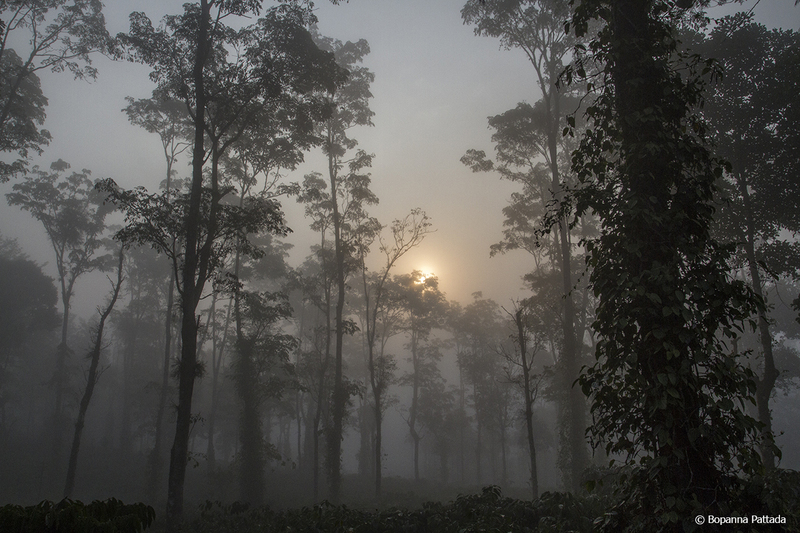 Bopanna Pattada is from Ammathi, Coorg and is a wildlife and bird photographer. He did his schooling from St Joseph’s Boys High School, Bengaluru and graduated as a computer science engineer from University Visvesvaraya College of Engineering (UVCE). An engineer by qualification, he ended his ten year career in IT by choosing to spend more time in nature. He is the proprietor of India Birding Adventures and leads birding and wildlife tours around India. Interesting and an informative read Bopanna…beautiful photographs too :-)! Nature glorified beautifully and very informative. Thanks for the write up. Wonderful write up ! Thank you so much for describing all the wonderful aspects of this trek. I have been wanting to climb this hill for a few years. How long did it take you .